Early last week Margaret Thatcher, former British Prime Minister, passed away, aged 87. She was a charismatic figure who was known internationally for being a strong and decisive leader. She had close political ties with President Ronald Reagan, she opposed the communist policies in Eastern Europe, and she was skeptical of increasing integration of the UK with Western Europe. Her actions and legacy are entwined with the global political stage at the time. However, in the UK she was very divisive and at times controversial, and even to this day there is a mixture of high praise a bitter resentment about her policies. Much has been said about her legacy over the past few days, and I think that, regardless of one’s own views, one of the best things we can say about Thatcher is that she knew what her vision was, and she pursued it with a great deal of energy and enthusiasm. During her undergraduate years, Thatcher was a chemist at the University of Oxford. It was only later that she studied law and became a politician, so from her very early career she had an appreciation for science. She knew about the care and attention needed to make discoveries, the frustration of waiting for data, and the need for peer review and skepticism. Given her status as an international leader, she had the opportunity to visit CERN in the early 1980s, but as a scientist she took so much more away from the visit than we could have expected. She’d asked to be treated like a fellow scientist, and her questions showed that she had taken her background reading about CERN seriously. She asked why the proposed accelerator, LEP, would be circular and not linear. This is not an easy question to answer unless the person asking has knowledge about how accelerators work. After a discussion with Herwig Schopper, then Director General, she came back to the UK as an ambassador for CERN and LEP was approved in the UK shortly afterwards. One of her questions was very astute. When told that the LEP tunnel would be the last at CERN she knew from experience that scientists will usually want to go further with their research and in particle physics at the energy frontier, further usually means larger. It’s true that CERN has reused the LEP tunnels for the LHC, but there are also proposals for even larger projects that will probe even higher center of mass energies. Once again Thatcher knew what question to ask, and Ellis knew what answer to give. Thatcher seemed convinced and knew that the people at CERN has the right attitude when it comes to discovery and use of public money. You can see some media coverage of her visit to the UA1 (Underground Area 1) site on the CERN Document Server. In 1993, three years after Thatcher left office, David Miller from UCL came up with an analogy for the Higgs field where Thatcher played the central role. Essentially we can think of the Higgs field like a room full of people milling around at a cocktail party. Someone famous and popular enters the room, and all of a sudden people crowd around, making this person’s journey through the room harder. They take longer to get up to a good walking speed, and when they are walking they become harder to stop. That’s essentially what mass is- a measure of hard it is to change an object’s velocity. The analogy goes further, to include rumors being spread from the vicinity of this famous person. They would spread in small groups of people, and each group would have its own “mass”, which is what the Higgs boson is, it’s just an excitation of the field in the presence of matter. Who was the famous person in this analogy? Margaret Thatcher, of course! So her legacy with CERN is one of a scientist and a politician. She was genuinely excited to see the discoveries take place, she met with the scientists personally and interacted with them as another scientist. She took the time to understand the questions and answers, and even challenged the physicists with more questions. At the same time she put the projects in context. 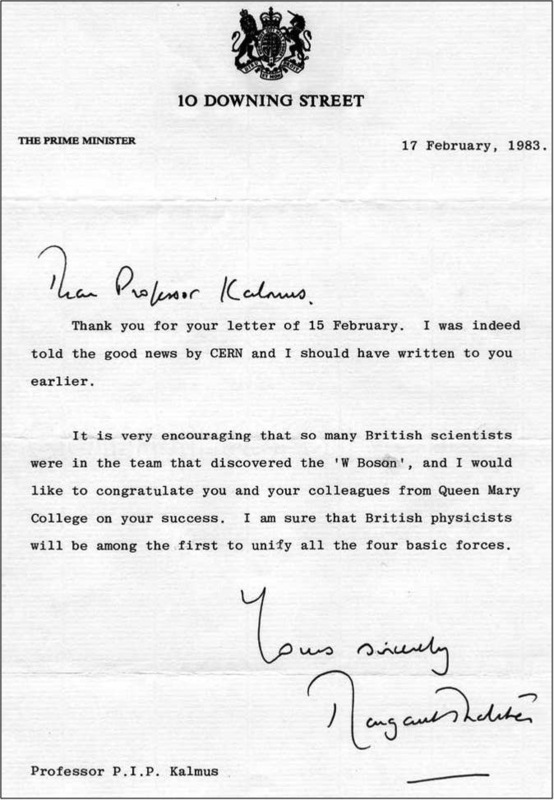 She had to defend the experiments, so she had to challenge the physicists to give her the information she needed to get the support from the UK. In a sense she knew the need for public outreach, to open up CERN’s scientific program to scrutiny from the public so that when we want to push back the frontiers even further we can count on their support. If we’re to keep pursuing scientific discoveries in the future, we need scientifically literate and inspired politicians. It would be tempting to say that they are becoming more and more rare, but in reality I think things are more favorable than they have been before. With the recent discoveries we’re in a golden age of physics that has made front page news. Multimedia outlets and the internet have helped spread the good word, so science is high in the public consciousness, and justifying further research is becoming easier. However before the modern internet era and the journalistic juggernaut that comes to CERN each time there’s a big announcement it fell on the shoulders of a few people, and Thatcher was one of them. One thing we have to add to this discussion is how media, news, and analysis enter into the political and policy-making process. One clear objective of science communications and even any corporate communications activity is to influence decision makers. But are the traditional streams of media still relevant? Fortunately, our excellent and thoughtful friends at the National Journal have just publicly released a detailed study of U.S. federal senior executive, Capitol Hill staff, and professional lobbyists that documents how information arrives and is used “inside the Beltway” in Washington, D.C. The study is entitled “Washington in the Information Age” and is, lightly put, brilliant. With grateful flattery, I reproduce some of their conclusions here. 1. As the dust settles, traditional platforms (TV, print media, and radio) remain essential components of the media mix. The report compiles hundreds of interviews and surveys to map out how U.S. political and policy staff receive their news. Perhaps as a surprise, it is NOT all by Twitter and Facebook. Rather, the new technologies serve as alert mechanisms with trusted, credible analysis still being sought from the traditional sources. 2. Despite the plethora of choices, opinion makers associated with long-established brans carry the most influence online. We all worry that a random citizen in Darkmoor, Pennsylvania, or Blackwater, California, can publish an online blog and start a slanted or even misinforming news source. It looks like the folks in Washington still rely on verifiable, credible, long-established names and resources to gather their views. 3. Yet, Washington insiders value a long tail of unique opinion makers. More than 400 distinct names were cited as credible sources for opinion from among the survey group. So the Beltway doesn’t follow one columnist or one voice; rather, each person tends to accumulate a set of trusted brands/thought-leaders and then sticks to them over time. So less fly-by-night than perhaps expected! 4. Washington insiders favour news sources that share political point of view. Perhaps obvious, but results show that Washingtonians cluster around columnists, news sources, and so on that reflect their own ideologies. 5. No longer just for e-mail, mobile devices are a gateway to news and information. Many Washington insiders now read news and analysis on the small screen and some actually do a good portion of their composition and analysis on the small screen. 6. Mobile devices and new digital communication tools continue to blur the line between the personal the professional. As in, with 24 hour news cycles and multiple streams of referrals and content providers, Washington insiders often mix work and play when communicating digitally. As anyone who has visited Washington knows, this is supported by the standard screens at a sports bar. Not only are two or three games showing at the same time, but at least one TV shows CNN and CSPAN. 7. Online video and audio have yet to infringe on the dominance of TV and radio. Despite the prevalence of online videos and podcasts, few Washington insiders report that they rely on these sources for content. They are viewed primarily as entertaining. 8. The national obsession with Twitter fades inside the Beltway. Results suggest that Twitter is not a preferred communication tool and the common conception is that 50% of tweets are pointless babble, and the next 30% shameless self-promotion. Beyond that, there is some real content. 9. Social networking sites are popular inside the Beltway. As a tool to track contacts, trade views, and keep up with the vast network of potential wanna-know-yous, social networking tools are growing in use. Perhaps not surprisingly, the growth area for these tools is with Capitol Hill staff who have a tendency to involve more younger people than senior executives or K Street lobbyists. 10. The more things change, the more they stay the same. Washington’s reliance on proven relationships extends online. That is, the influencers of the influencers still have specific, personal, trusted connections. Other results of the study show that Washington insiders filter their e-mail by known e-mail addresses, then subject lines, again caring more about WHO than WHAT. The study is powerful insight into how Washington is adapting to the age of information overload. 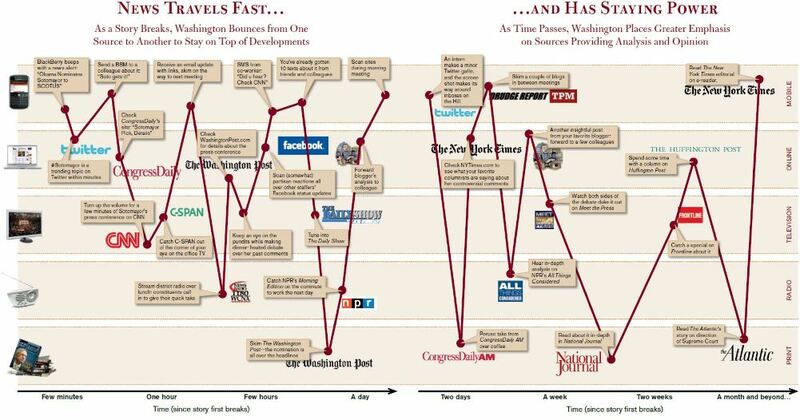 Graphic depicting how Washingtonians "flip" between news sources to follow a story. Please read, compare, and comment! As many of you are undoubtedly aware, the U.S. federal government is in the midst of a budget crisis. The prevailing wisdom in Washington is that deficits are out of control and will soon bring America to ruin; therefore, drastic budget cuts are necessary to ensure the nation’s future health and prosperity. Okay. Let’s take for granted that this is true. Let’s also ignore the official policies and recent acts of Congress that fly in the face of fiscal responsibility. We should probably also narrow our vision to the short-term — say, the next two years — to avoid unpleasant long-term realities. Now, I am not an economist, but it seems clear that this is absolutely devastating. If the budget proposal is passed as-is, thousands of scientists will be laid off, operation of current experiments will be disrupted, and many new projects simply won’t receive funding. Cutting-edge research will be especially hurt — and yes, dear readers, that includes high-energy physics. (Recall the impending shutdown of Fermilab’s Tevatron, for lack of funding.) A wide swath of American scientific research will be stifled. Since basic research and resulting scientific innovations drive long-term economic growth, this is, at best, a short-sighted attempt at reducing our national debt. At worst, it is a self-destructive travesty of pandering and ineptitude that results when politics and reason become mutually exclusive. I won’t force my position on this issue, but I will point you to a place where you can work the US budget out for yourself: http://public-consultation.org/exercise/. (See how easy public policy decision-making is when you aren’t beholden to the funders of your previous election campaign?) After that, perhaps you would be inclined to contact your elected officials to let them know what you think about all this: http://www.usa.gov/Contact/Elected.shtml. By any measure, science is an excellent investment in the long-term success of our nation. It should not be a political punching bag. Make some noise, folks! This is serious. This is an historic election, and I recognize the special significance it has for African Americans and for the special pride that must be theirs tonight. That special pride belongs to all of us, Senator McCain.